A Google Streetview Image of George and Mary’s Tavern on the northeast corner of Parkdale Street and Melvin Avenue. It’s an East Hamilton landmark which in its glory days was one of the best establishments in the entire city, George and Mary’s Tavern. In recent years, numerous fires, a leaky roof, poor management of the residential units above the bar, and the industrial decline of Hamilton have contributed to make the building an eyesore and community nuisance. Affordable housing provider Indwell recently took ownership of the building and plans to retrofit the building for 60 affordable single units. Indwell is asking the Committee of Adjustment to grant permission for 60 apartments of 24 square metres each as a multi-residential building, replacing the existing lodging zoning. Hamilton’s multi-residential building zoning only allows for 10 apartments on the site, and requires each apartment be a minimum of 65 square metres. Graham Cubitt, Indwell’s Director of Projects & Development, says the building had an existing 60 rooms under its previous zoning lodging with existing washrooms and kitchenettes. The variances are required to legalize the existing units. 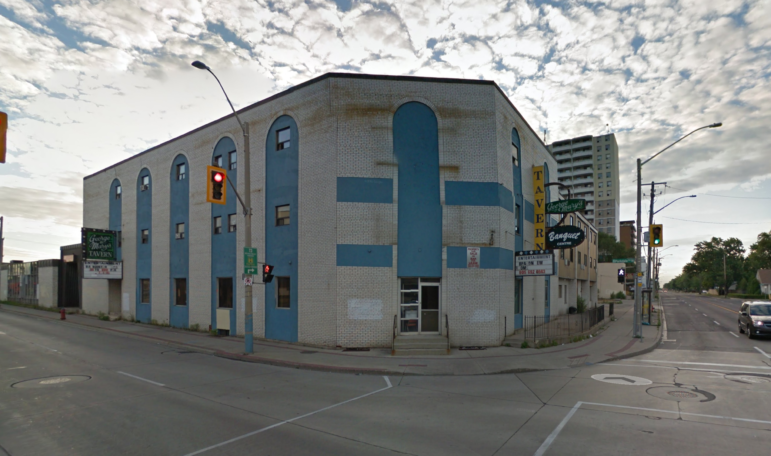 The first floor will remain commercial, the existing variety store will remain and the former tavern and banquet centre will become commercial retail or offices. The upper floors will be completely renovated with new electrical, safety systems, roof, and energy retrofits. “The building structure is great and sturdy”, says Cubitt. “The inside needs a lot of work”. Parts of the rear of the building, where there are foundation issues, will be demolished. There will be an outdoor patio and community garden on the roof and common spaces inside the build for residents. All units will be affordable, and many of the units will come furnished. Indwell’s well known for its other East Hamilton projects, recently renovating and refitting the Strathearne Suites, Rudy Hulst Commons, and Dr. John M. Perkins Centre. Pocket housing has been identified as one of many means of addressing affordable housing in Hamilton. Committee of Adjustment scheduling note: There are three separate variance applications near McMaster University prior to this hearing and CoA could be running behind schedule. Are the rooms going to be like this.That a great Idea. Hope it works out. It would be very ideal to furnish it just like the video. Self efficient.